Just returned from Bali but still not back in Melbourne. We had a great time in Bali eating, shopping and relaxing. The Balinese people are so friendly. Our driver picked us up from the airport. Gosh! The only downside was the wait at the passport counter. I had to pay USD10 for an Indonesian Visa but all went smoothly. 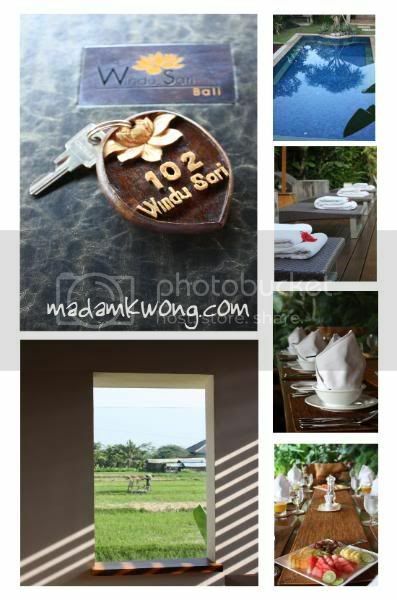 We stayed at the Villa Windu Sari. Coincidently, the villa is owned by an Australian. I wonder who he/she is? The hospitality provided by the Chef, personal butler and personal caretaker was outstanding. Villa Windu Sari – the name is loosely translated as ’a beautiful place in time’ – is a peaceful oasis in the heart of Petitenget on Bali’s southwest coast. Designed by the internationally acclaimed architect Glenn Parker, with interiors by Dean Kempnich and landscaping by Anto Kusnanto, the four-bedroom villa is characterised by an abundance of teakwood and marble. It is comprised of two shingle-roof pavilions housing a magnificent open-sided living and dining area, a cosy media room, an entertainment terrace, a gym, four bedrooms on two levels, a kitchen and a service area. The property is set within a delightful walled garden complete with a feature swimming pool, and nestled within a safe and secure private estate, just a few minutes’ walk from the beach and a whole host of world-class restaurants. It is ideal for families with older children. The most interesting and a “must do” when in Bali is to eat “Babi Guling” (suckling pig). I won’t post the pig, don’t want to get in trouble with animal rights :D. I shall post more photos of the places we ate in the next post. Hey people after a long time i read some really interesting topic and now i really want to go this place for my holidays.